Stitch a sweet monogrammed bag accented with a whimsical monogram and fun ric-rac or other trim. Choose a clear vinyl or mesh fabric front for a truly customized case! 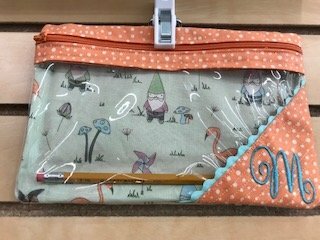 In this class we will make a medium sized (5.9” x 9”) monogrammed zipper bag completely in the hoop with vinyl and 2 fabrics. This little bag is perfect for you sewing notions, or makeup, or art supplies. You could even use it for you liquid carry on when traveling. And, because it's done in the hoop everything -- including the zipper is perfectly sewn! Designs include Extra-large to small bag sizes.